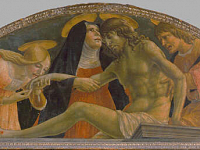 Sanseverino’s partial altarpiece, Pietà, is one of the only known pieces by the artist. It is the top part of the altarpiece showing the Mystical Marriage of Saint Catherine, originally painted for the church of Santa Lucia in Fabriano, from around 1491. Hardly anything is known about the artist, other than that he was from the circle of an artist named, Girolamo da Camerino, of who little is known as well. They were identified within artworks distinct from the Marches of Italy, a region that has received little critical attention. (Kren and Marx, Web Gallery of Art). The work, Pietà, was first acquired by the National Gallery of London, which still has the original altarpiece, The Marriage of Saint Catherine of Siena; the Uffizi obtained this top portion in 1902. Another piece attributed to Sanseverino is, Virgin and Child with Saints Anthony, Abbott, Mark, Severino and Sebastian, now in the Cleveland Museum of Art, U.S.